Is it plausible for a being to possess a singular halo-shaped 'horn', while other members of the species possess two 'regular horns'? I am currently working a humanoid roughly deer-like species in a sci-fi roleplay setting, and one of the developments I have had with such species has me stuck trying to explain it in a way that makes somewhat of sense. 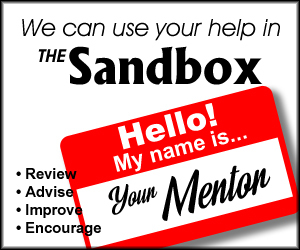 Furthermore, I apologize if this question breaks any rules, I am still rather new to the site. These guys are known as the Vruk'yeol or 'Cervidani' as many oddly call them. They walk on roughly digitigrade legs with weak hoof-structures being overtaken by a proper foot. One interesting element of this species to note are their various shapes of horns, growing from out behind of their head plates. These horns are often noted to grow into a strange circular halo shape, with various forms of regular double horns taking the place of common appearance over them. Is there any reason or way for this species to possess either option of horns among its living members? One theory I have developed is that during early development of the horns, they could all grow as halos as such, but at a certain point they could 'break' naturally, forming two regular horns that would follow the regular path of horn development for this race. For some of them the breaking doesn't occur, leaving the horns to remain as a singular halo. Is this a sound assumption? Possible, but unlikely given the pain that would likely ensue. There's a good reason why most animals with horns (and generally only the males) develop their horns at puberty; live birth. When you get right down to it, the advantages that horns provide in combat and display to females is counterbalanced by the difficulties they would present during birth; a smooth head is what you really need for a species to find it easy to birth the next generation. Evolution has solve that by providing smooth crania for the young, and horns / antlers for the mature. As such, antlers and horns generally tend to form symmetrically in the same way as the rest of the body. This is the primary reason that most species have two horns or antlers instead of one. If the horns manifest during puberty, then it's possible that the horns grow towards each other and fuse during maturity. 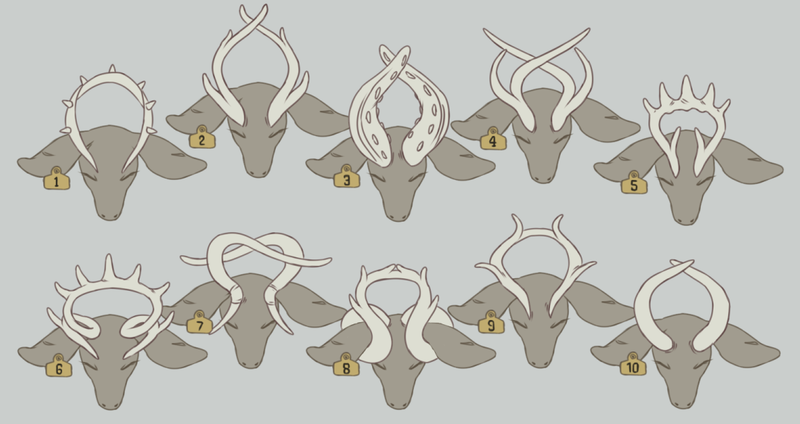 These would be simpler and easier to explain from an evolutionary perspective, but would no doubt present painful situations for your halo antler recipients as they would firstly breach the skin as part of the normal horns, then fuse later on once they've grown to a certain size. Realistically, if 'halo' horns were a reality, then your concept of being born with a horn (or bone) halo which 'breaks' in certain cases would seem to be the most plausible solution to this. That said, such an evolutionary trait is unlikely as it would introduce additional complications to the birth that make successful delivery less likely, not more. As such, the current model of no horns at birth, then growth at puberty seems far more likely than the model you present. It should also be noted that halo horns are unlikely to develop in any event in an environment with intelligent predators / hunters because humans realised pretty quickly that horns and antlers give you purchase for snapping the neck of your prey if you've wounded or disabled it at some point. In other words, such horns present a combat and predatory weakness that other animals would exploit if at all possible, and the ability to present to females only goes so far in offsetting that weakness. I agree with Tim on beong born with horns. That said, what I see is during puberty the creature starts growing a single horn at the center of the forehead. As days pass the cells producing the bone and/or kerarin for the horn start migrating to either side of the head. When this process begins the horn gets brittle in the middle of the stem and fractures into a halo. Then, for some guys the halo stays, for others it also fractures at the middle. This migration may also do for a variety of halo shapes such as can be seen in the image you are using for inspiration. Each specimen may undergo through different patterns of cell migration due to genetics and lifestyle. Certain cultural groups modify their babies to cause the halo horns. 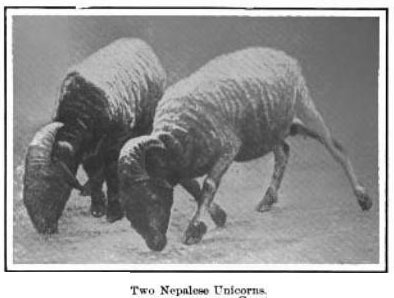 "There is no special breed of one-horned sheep in Nepal, nor are the specimens which have been brought here for sale natural freaks. By certain maltreatment, which is described below, ordinary two-horned sheep are converted into a one-horned variety. The process adopted is branding with a red-hot iron the male lambs when about two or three months old on their horns when they are beginning to sprout. The wounds are treated with a mixture of oil and soot, and when they heal the horns, instead of growing at their usual places and spreading, come out as one from the middle of the skull. I have seen unicorn goats. As kids, their horn buds are surgical moved together so as to produce one horn instead of two. It is entirely plausible that a cultural group would modify its children so as to change the adult phenotype. Circumcision is probably the best known but foot binding, head flattening, neck stretching and many, many other body mods have been practiced by one group or another over history. Why would a social group want to distinguish itself by horn shape? Maybe they are peaceful and this seems a less aggressive display? Maybe it is safer for sapient individuals living in groups? Maybe their holy book mandates it? It's not biologically implausible for a regular two-horned ungulate to have horns that curved inward, and once they make contact proceed to twist together and develop into a single "halo". Many biological structures will twist around obstacles as they grow. The real question is why this would be evolutionary advantageous. Split horns are superior for fighting and pretty much everything that an animal might want horns for. One possibility is that the species is social and intelligent, and only the "village leader" has the halo structure. Most individuals wear down their horns through fighting and scraping them against things, but once an individual has enough followers that they no longer need to actively fight to defend their position, they let their horns grow together. It could be this species equivalent to the "fat chief"; an indicator of personal success (and probably a sign for potential mates). Not the answer you're looking for? Browse other questions tagged science-based reality-check creature-design science-fiction evolution or ask your own question. What alterations without drastically altering their humanoid shape nor horns, can I make to my species that lower the risk of neck snapping?